Antibiotic resistance is the resistance of previously sensitive bacteria to antibiotic medicine and is a major threat to global health and well-being. 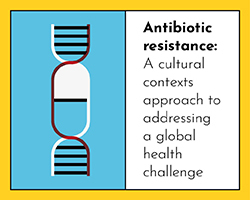 Antibiotic resistance has multiple causes and there are many approaches to reducing resistance, which span the biomedical, social and cultural spheres. This webinar will investigate the cultural factors that shape antibiotic use and help in understanding the transmission of antibiotic resistance, such as the way culture shapes the protocols defining how antibiotic resistance is researched and regulated. The webinar will also launch a policy brief examining the cultural contexts of antibiotic resistance and approaches to tackling this issue.